Many e-cigarettes and vaping devices look like everyday items – such as pens, asthma inhalers, iPods and lipstick tubes – which makes it easy to disguise their use. 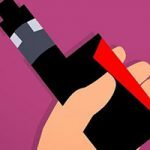 One popular vaping device that kids are bringing to school these days is the Juul vaporizer, which looks like a USB flash drive and can be charged by plugging it into a laptop. The Juul is small enough to conceal inside an enclosed hand and comes in eight different kid-appealing flavors. Packaging designs for some vaping liquids look a lot like popular candies, which could confuse some children and lead to accidental poisonings.